The weather today has been typical March... a little rain, a little snow, mix in some wind and even a spot or two of sunshine and Voila' ! a perfect day to stay inside and paint! 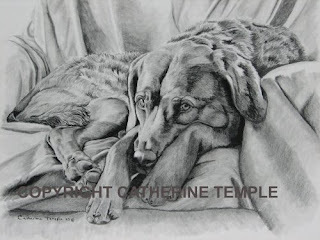 That's what I would have liked to do, but instead I had to take pictures to the framer, run some errands, you know, everything that kept me out in the weather and away from the studio. The count down is on with only three weeks until my first show of the year so I'm running like a chicken with my head chopped off. I woke up this morning at 3 a.m. with my mind whirling with ideas and things I need to remember to do. Good thing I keep a note pad on the table next to the bed so I can jot things down! Eventually, I got back to sleep right in time for the alarm to go off!! Arghh! 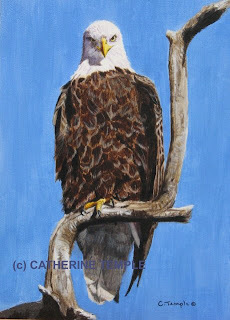 Today's painting is another eagle done from the same reference as the last. It is 6" x 6" painted in acrylic on watercolor paper. The reference photo was taken on a bright sunny day against a clear blue sky, but I wanted to do this one with a dark background to make the bird stand out more. This painting was done more as a study just to see if the color and contrast would work, but it is for sale. If you are interested email me..... kindredspirits@clearwire.net and I'll get you a price. Also, keep watching my Etsy store as I will be adding more items in the days to come. You may even see this eagle there. Well, I'm hearing things blowing around and banging into the house. Since I'm in the basement and can't see I guess I'd better scamper upstairs and see what this March weather is doing now! Blessings til next time! "Eagle 1" has landed! Sorry, I just couldn't resist the play on words! This is the first of the miniature paintings I've been working on for my upcoming shows. 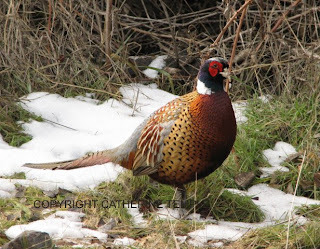 Living in an area with two major rivers gives me great opportunities to view a lot of wildlife. We have several eagles that work the rivers in search of food and I came across this one on one of my many morning walks. It was gracious enough to sit on it's high perch and allow me to photograph it, though it looks none too happy about it. I was actually able to get quite close. Not all of them are as cooperative as this one was...most fly off about the time I get close enough for a really good shot. 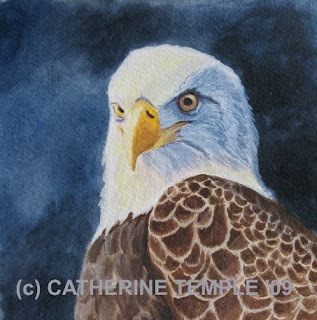 I was able to get several nice photos before this one took to the skies so there will be more paintings in the future, hence the name "Eagle 1". This one is done in acrylic on a masonite panel. It is 5" x 7" and is for sale for $175.00. Inquiries may come to me at kindredspirits@clearwire.net. Lots of exciting things have happened since the last time I wrote. 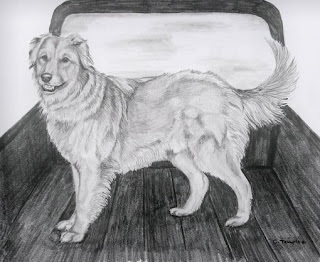 First, the Art Show at the Dog Show has posted images of all the winners on their site so now everyone can go and view who the lucky 50 artists were that won awards. All of the final entries are on display so you can see the competition and judge for yourself. 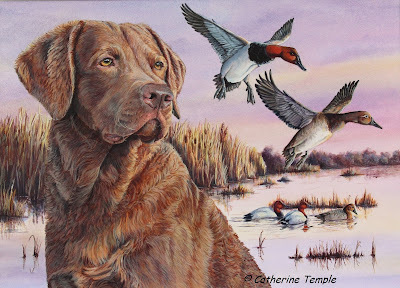 It is an awesome display of canine art. Please take some time to take a look. I have recently set up a storefront on Etsy which, if you're not familiar with it, is a site dedicated to selling all hand made items. 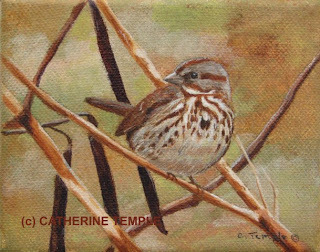 Right now I have only my ACEOs listed, but in the next few weeks I intend to have original artwork, prints and note cards available for purchase there. You can get to my store through this link ctempleart.etsy.com. Please drop by for a look. If there's something not there that you would like to see drop me an email. I do commissions and requests! That's about all the news for now. I'm off to complete the three miniature paintings waiting for me in the studio. I'm working on three at once... a black lab puppy, a yellow lab puppy and a golden retriever puppy all done in acrylic. With any luck I'll have them done today!